I got a small start on the blue peacock last night, so I'll be working on him today. Write soon! Nicole it looks great and I can see why you don't think you're going to get bored with it! I promised myself I wouldn't start this yet, but I might have to cave - I really like yours so far. Your work looks fantastic! I love this design and seeing it on your blog really brings it to life. I took a look at the stash you showed in your previous post. You have a lot of great things to stitch. I can't wait to look at the BBD Joyeux Noel book. The lions look beautiful! Look forward to seeing the peacock grow. I'm lusting over yout stash haul, and now am drooling over your new start. Hmmmm. Lustng and drooling. Pretty picture, eh? I just love watching your progress Nicole! I am wanting to get this chart more and more watching your progress. Of all the things from the St. Charles market, this one stood out and it does look like you are really enjoying it. I love watching your beautiful progress! My dh is a Leo and I think he would like this one too! Well back to my SOhrh this afternoon! ohhhh, look at thats stash...I am drooling! What a nice start too. 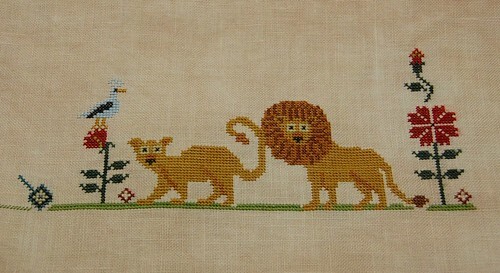 Oh, I just knew this would be such a fun piece to stitch - it looks wonderful. Love it!!! Can't wait for mine to come in at my LNS! MEOW! This looks like so much fun. OMG! How freakin' cute are they? I love the lion couple. Love it!! You're distracting me from Frederick! Stop it! lol! Looking Great !!!! I love all your new stash !!! Don't you love stitching on it? I started with Adam and Eve and the snake :-). Your's is gorgeous, I think I am going to have to work towards that right corner. Those lions are so darn cute. I love your progress so far - this looks like a fun, winter stitch - bright and cheery when outside it's cold and dreary. This is sorely tempting me! Fantastic progress! It is looking gorgeous! Oh, yeay! I was going to ask you if you've stuck with PL and now I see you have. :) You're making FABULOUS progress! Love it! Love love love this piece! You've made amazing process on it. And love your market stash! WOW! !